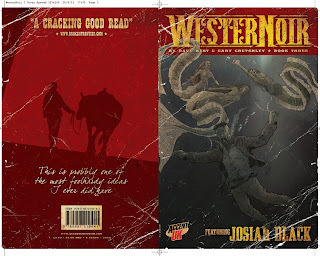 WesterNoir Issue 3 arrived Thursday morning. Once again the guys at UKCOMICS had come up trumps and delievered to a very high standard in a very short time. 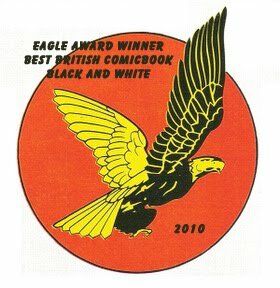 Stuart Gould, at UKCOMICS, gets comics and more importantly he gets Independent Comics. He knows what we're like. He knows we only manage to pull things together on the 11th hour and he takes this in his stride. I'm always really happy with the results. So, here we are with Issue 3 in our grubby little hands. Andy Bloor's cover design layout still makes me smile and the three of the books sat together really do have the feel of a cohesive on going story. Inside the pages are sharp and clean and my worries about the double page spread lining up were needless, once again Andy made sure it all came together nicely. Gary Crutchely is driving this book for us. He's the one who prompts the get togethers where we lay out the plot, the twists, the ebb and flow, and he's the one who then lays out the plot and thumbnails the pages before we agree the issue and he sets down to work his magic on the finished art. We took Issue 3 to the Manchester MCM Expo yesterday and it was a real pleasure to see customers of previous issue just walk over to it and pick it up. No need to hit them with any details, they just bought their copy as they would any ongoing series. Yes, we now have an ongoing title on the table, and it feels great. Gary and I will be sending out review copies over the coming weeks, so if you're a reviewer for a website or blog then get in touch (the email address can be found on the Accent UK website) and we'll send a copy your way.